Angela Bassett and Joel McHale buddy up on the red carpet as they arrive for hosting duties at the 2019 The Hearts for Hope Gala on Saturday night (February 16) at the Beverly Hilton Hotel in Beverly Hills, Calif. The 60-year-old Black Panther actress looked so chic in a white suit while the 47-year-old talk show host sported a black tux for the event. Joining Joel on the red carpet was his wife Sarah Williams. The event was held to benefit the Union Rescue Mission – which is a private Christian homeless shelter in downtown Los Angeles’s Skid Row. FYI: Angela is wearing an Ester Abner suit. John Cena happily flashes a smile alongside SI Kids SportsKid of the Year honoree Leah Hayes while attending the Sports Illustrated 2018 Sportsperson of the Year Awards Show held on Tuesday (December 11) at The Beverly Hilton in Los Angeles. 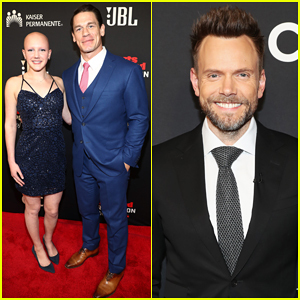 The 41-year-old pro wrestler and actor was also joined at the event by host Joel McHale, Camille Kostek, Akbar Gbaja-Biamila, Ike Barinholtz, Performer of the Year award recipient Aaron Donald and Inspiration of the Year award recipient Rachael Denhollander. Ike hit the stage to honor John with the SI Muhammad Ali Legacy Award for his dedicated philanthropic work with the Make-A-Wish foundation for granting nearly 600 wishes over the years. Tune in to NBCSN on Thursday, December 13 at 9pm ET to watch the one hour Sports Illustrated Sportsperson of the Year Awards special. Joel McHale & Maria Menounos Kick Off Holiday Season at Jennifer Klein's Annual Party! Joel McHale and Maria Menounos share a cute moment while waiting for their cars at the valet following producer Jennifer Klein’s Holiday Party on Saturday (December 1) at a private residence in Brentwood, Calif. The star-studded party kicked off the holiday season with a whole lot of cheer. Guests went home with tons of fun goodies and Joel was seen holding some of them! Sidecar Doughnuts was serving holiday-themed doughnuts in the driveway and Joel grabbed a few treats to-go. He also grabbed a couple cases of Health-Ade Kombucha’s Holiday Cheers probiotic tea. One of the biggest hits of the night was Anthropologie’s Snow-Much-Fun holiday gift room, where stars picked fun holiday gifts like bath products, scarves, and more on their way out of the party. Coffee Bean and Tea Leaf was in the driveway for guests to warm up with coffee or hot cocoa upon their arrivals and exits from the party. Icelandic Glacial Water had bottles of water on hand for guests to grab on their way home and they also were the exclusive water inside the event. Sprinkles collaborated with Klein to create three-packs of mini cupcakes for guests to take home. There were also cookies, brownies, layer cakes, and cupcakes inside the party! Some more treats that guests were able to bring home included Cake Bams rice cakes, Dang Foods’ coconut chips, individual packs of Barney Butter’s almond butter, and Olly protein bars. More stars spotted inside the party included Topher Grace and his wife Ashley, James Wolk, Katheryn Winnick, Josh Gad, and Jay Ellis, among many others! 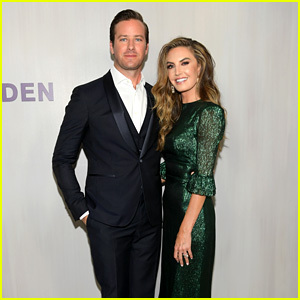 Armie Hammer & Elizabeth Chambers Attend Hammer Museum Gala in the Garden 2018! Armie Hammer and Elizabeth Chambers are looking so good together! The married couple were in attendance at the Hammer Museum’s Gala In The Garden With Generous Support From South Coast Plaza on Sunday evening (October 14) in Los Angeles. Tom Ford, Zoe Saldana and husband Marco Perego, Joel McHale and wife Sarah Williams, David LaChapelle and John Waters were among the attendees at the annual event. The Gala in the Garden, honoring Margaret Atwood and Glenn Ligon this year, celebrates artists and icons who have made profound contributions to society through their work and provides proceeds to support the Hammer Museum. FYI: Elizabeth is wearing a The Vampire’s Wife dress. Zoe is wearing a Dolce&Gabbana dress and Jared Lehr jewelry. Kaley Cuoco & Joel McHale Act in Drake Lyrics Soap Opera - Watch! Kaley Cuoco and Joel McHale are using Drake‘s lyrics to act out a soap opera! The stars made an appearance on The Late Late Show With James Corden on Wednesday night (September 19). Watch the funny skit below! Chris Evans flashes a smile while attending the star studded grand opening of Simone in the Arts District on Saturday (September 15) in Los Angeles. The 37-year-old actor was joined by his Avengers co-stars Scarlett Johansson and Don Cheadle, as well as former Community co-stars Gillian Jacobs, Joel McHale and Yvette Nicole Brown as they all celebrated Simone, the new restaurant from Avengers: Infinity War director Joe Russo and James Beard-winning chef Jessica Largey. Also in attendance to show their support was Taika Waititi, Don‘s wife Bridgid Coulter, Marisa Tomei, Modern Family‘s Julie Bowen and Jon Favreau, who helped produce The Avengers and its 2015 sequel, Avengers: Age of Ultron. The restaurant — which will officially open to the public on Thursday, Sept. 20 — aims to create a relaxed atmosphere while offering guests produce-driven California meals with eclectic flavors.